Perhaps it's finally not rumor anymore since Brewkkake broke the story earlier today that Allagash Brewing decided to stop distributing their beers to Florida. Now I was expecting a better "Pulls Out" joke from Brewkkake in his narrative, but you could see he was clearly shaken from the news. Apparently this brewery was his introduction to good beer. (BTW, I neglected to use the word "Craft" there because, despite good intentions, I think many people might construe that as a totally snobby exclusive clubby word!) For me, Allagash was limited here and was decent, but whatever. There are other beers that easily replace what was available! No tears! For example, tonight I'm starting my weekend with a little help from my (other Maine brewery) friends. 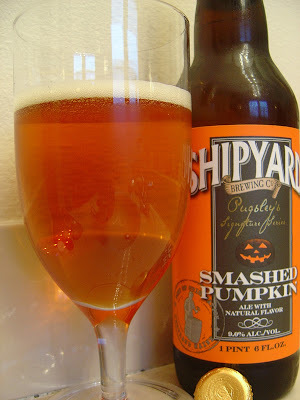 Those friends work at Shipyard Brewing Company in Portland, Maine, and my selection is Smashed Pumpkin Ale. 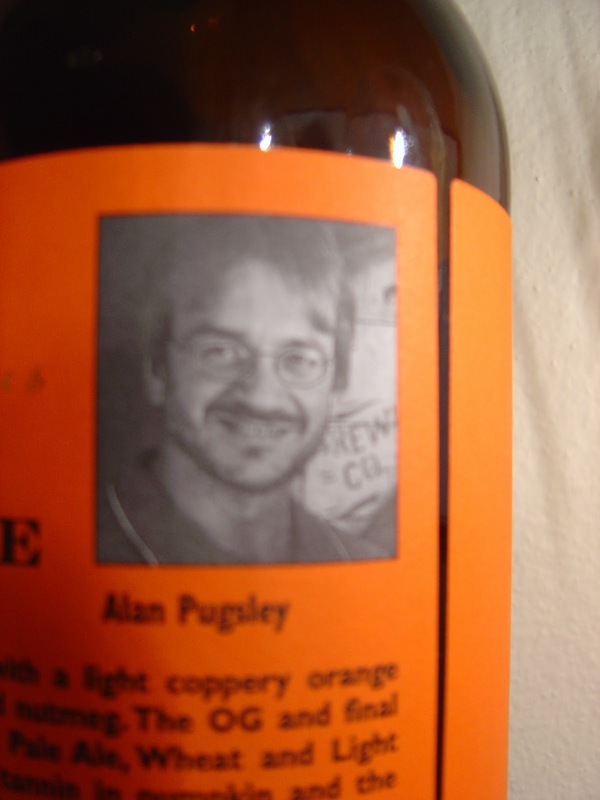 This beer is a member of Pugsley's Signature Series, and in fact Alan Pugsley is pictured on the back of the bottle (and blurrily below). 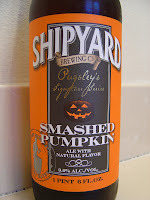 I recently had the XXXX IPA from this Pugsley series and was amazed. Terrific! I even used that beer as exhibit A in a First Grade math lesson. The 22 ounce bottle has a beautiful presentation with dark grays and whites standing out on top of a rich Flyers Orange background. Cute little pumpkin in the middle too. The cap and neck is (was) covered with gold foil as well. Drink at 55 degrees F.
Now this guy has a nice pumpkin aroma and a strong nutmeg and ginger spicy complement to that. The flavors start out quite rich and malty, distinctly pumpkin all around. The initial profile is sweet, yet a whopping wave of 9% alcohol rolls in to kick that down a notch or five. Balance returns. A sweet orange flavor also persists throughout the entire experience. Brown sugar and plenty of spices abound, but not just the nutmeggy pie types. There is also a definite hoppy black pepper bite. Not a smooth beer; rather, prickly in the mouth with the alcohol and spices and carbonation. Overall, a little rough around the edges, a little boozy by the end. However, I really liked this one. Nice job, Shipyard! Pug Dog Plush Toy "Pirate Pugsley" 7"
Again, pictures inside due to torrential rain. 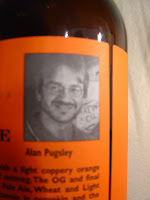 Sorry you're so blurry, Alan, but we get the general idea. 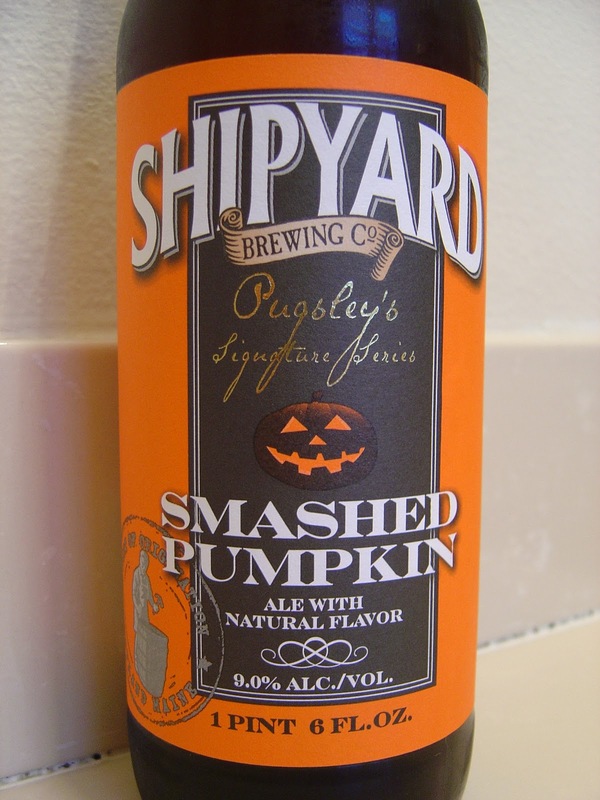 Yeah, I guess I'll have to break down and buy their Pumpkinhead too. Jeez, I told myself not too many pumpkins this year, but it's tough.